If you have a cottage or a private house, then you most likely have already thought about the possibility of using an attic. Most often in the households of the old model access to the attic is made from the street. Surely you will agree that in winter it is inconvenient to call on him in this case. 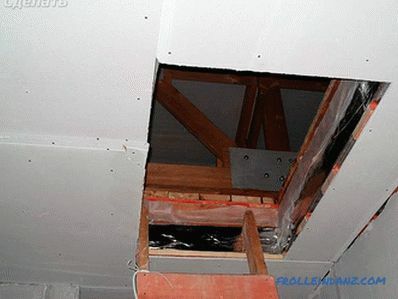 In view of this, our article will discuss how to make a hatch to the attic. The hatch arrangement will be relatively inexpensive. 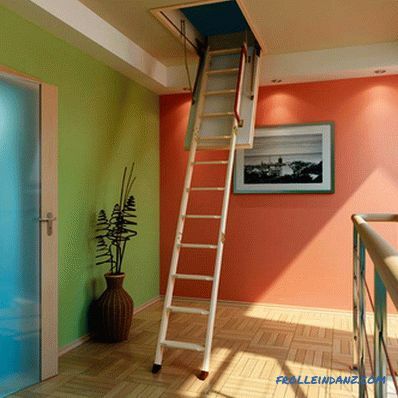 If the attic is used infrequently, then the hatch with a ladder will be quite enough to ensure free access to the attic. If there is no heating in the attic room, then the hatch must be warmed. The end of a case is better than its beginning, so before embarking on a work process, it would be wise to think through all the possible nuances and difficulties on the way to achieving the goal, in our case of making the hatch. So, it is important to take into account the slope of the roof, as well as the location of concrete slabs or wooden beams in the ceiling. Ultimately, the hatch should be as functional as possible. The staircase should not block the space of the room, thereby interfering with the free movement. 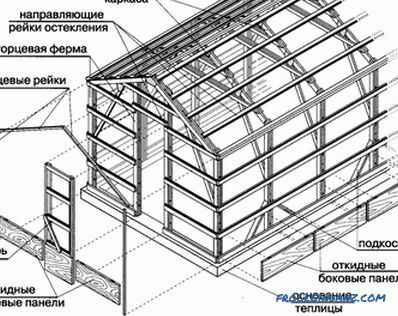 Someone decides to draw a schematic / drawing of the hatch by hand, and someone draws up a drawing in DWG format. Here, as the soul desires, it is only important that the parameters and dimensions of the hatch are taken into account in the process of drawing a diagram or drawing up a drawing. The standard size of the hatch hole is 60 * 120 cm. 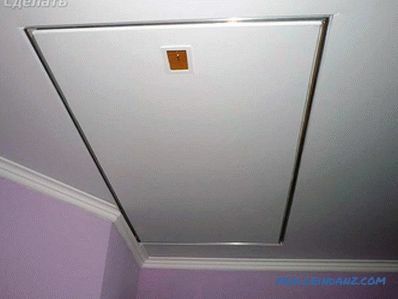 The horizontal hatch is installed on the ceiling surface. 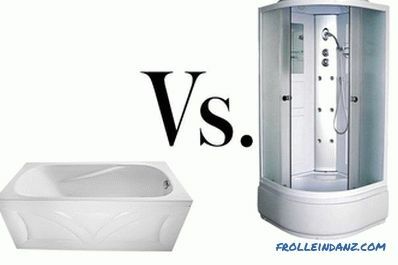 Its easiest to do, and in terms of functionality it is considered the most convenient. Angle view is usually installed in a sloping roof on the attic room. The vertical hatch is made as a manhole. 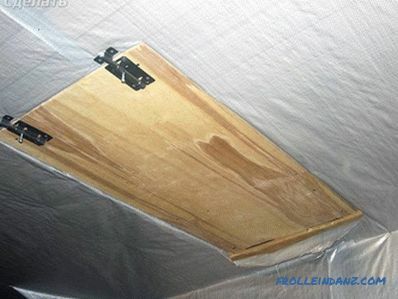 A hatch in the ceiling can be made of metal, wood, plastic or other alternative material. 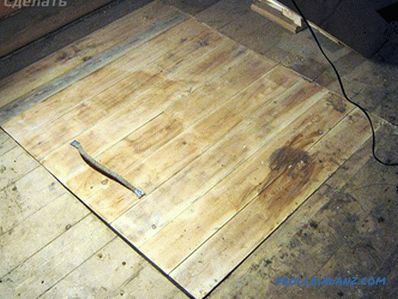 As a rule, wood is used for self-manufacturing of the hatch. 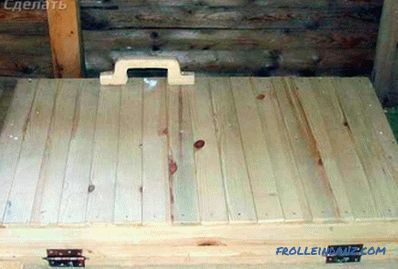 Now we will look at each stage in more detail, which will allow you to make an attic door with your own hands. In the process of making the opening, it is important to consider the type of flooring that can be made of wood or reinforced concrete. Consider the features of the work in the manufacture of the opening for each type of overlap. 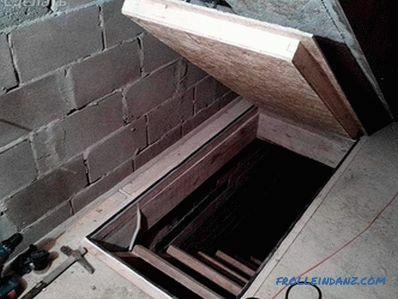 If the installation location of the hatch is selected and all the criteria for its location are taken into account, then it's time to start cutting out the opening. To start, make a markup. The dimensions of the opening must be 5–6 cm or more larger than the finished hatch, taking into account the thickness of the boards from which the frame will be made. The cut part of the ceiling covering can be used as a trim for the hatch cover. The resulting opening should be reinforced beams. It’s worth telling right now that it is much more difficult to make an opening in a concrete ceiling than in a wooden one. If you make an opening not at the junction of reinforced concrete slabs, the overlap will lose its strength. In addition, if you make an opening at the junction of the plates, it will contribute to your own safety. 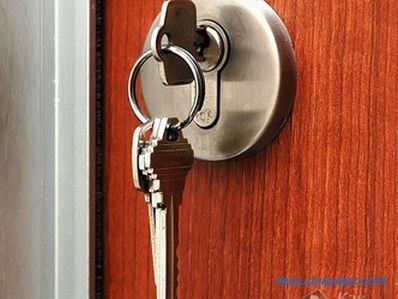 As is known, concrete is a durable material in which it is not so easy to make an opening. 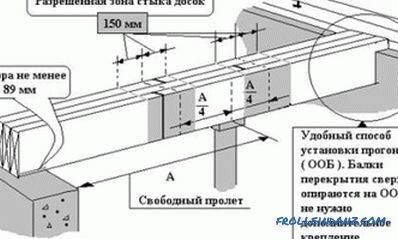 However, as practice shows, it is possible to cope with this task in 1-1.5 hours, provided that you have a Bulgarian with discs for concrete (diamond-coated) and metal. The disc diameter must be at least 220 mm. You will also need a sledgehammer, scrap. To make smooth corners, you will need a drill with a drill, the length of which must exceed the thickness of the slab. So, you should install a perforator vertically and drill through holes in the corners of the future opening. The perimeter of the hole should be marked, for example, with chalk or construction pencil. Then cut the grinder disc on the concrete line around the perimeter. This should be done at the top and bottom of the slab, not reaching the reinforcement. Otherwise, the diamond coating will simply burn. Then, using a perforator, find in the slots of the void, for this, drill through the overlap. The weakest points need to be smashed with a sledgehammer.Places that are held on the fixture should be broken with a crowbar. After you need to cut off the reinforcement. You can do this with the help of the grinder, cutting the disc into the plate. This will be needed so that in the next stage of the hatch, you can insert the frame into the opening. All irregularities on the faces can be eliminated with a diamond disc. 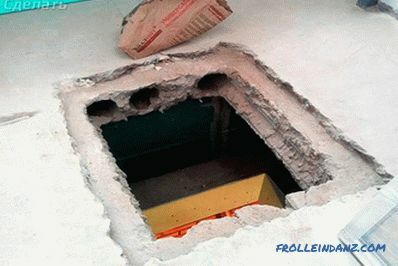 The hole under the hatch in the concrete ceiling should be reinforced with iron corners. For the manufacture of the frame, you will need boards that are 2-3 cm thick. Thus, additional strength of the base is provided. The frame must match the size of the opening. It can be rectangular or square. It is important to strictly observe the straightness of the corners. After assembly, the frame must be installed in the opening. The simplest variant of the lid is to make a skeleton and attach the remains of the ceiling covering to it, if it has retained its integrity. 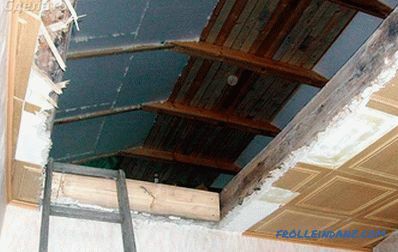 If the ceiling covering is crushed, for example, when making an opening in reinforced concrete, then the cover can be made of wood. In any case, it must be reinforced cross. The cover is attached to the frame with hinges. It is important to consider where it will open - inside the room or in the direction of the attic. To open and close the lid was smooth, you should equip it with closers. 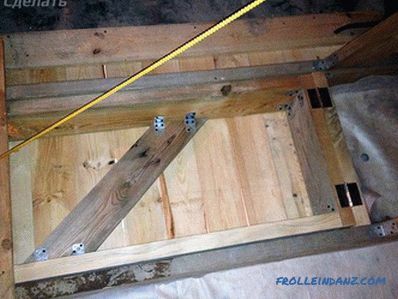 You can purchase a folding attic ladder attached to the hatch cover. Very convenient if the attic is used regularly. In this case, you will not have to assemble the frame and the cover, since all this is already pre-assembled by the manufacturer. 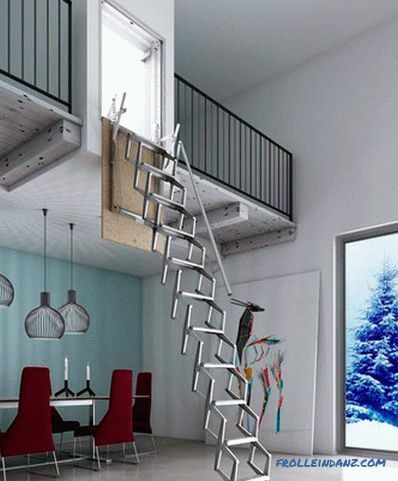 Folding garret ladder with a lid is equipped with mechanisms for smooth opening and closing. After making the opening, you will need to install the ladder according to the instructions. 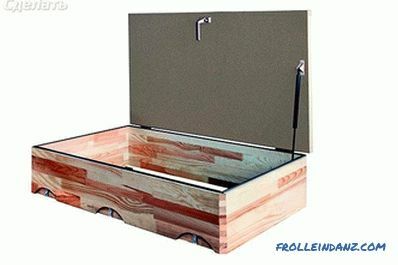 A lid with a built-in ladder will open downwards, so it is important to install it flush with the finish of the ceiling. When making the cover yourself, you will have to insulate it. 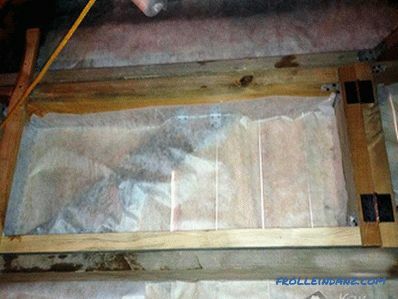 Thermal insulation should be invisible for viewing from the room, so it should be installed on the inside of the cover. Insulated sunroof will save heat in the room. This is especially true if the attic is unheated. Extruded plates are best suited as a thermal insulation material Styrofoam thickness you need. 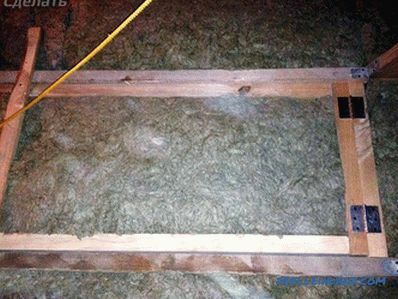 Insulation can be closed with plastic or chipboard. 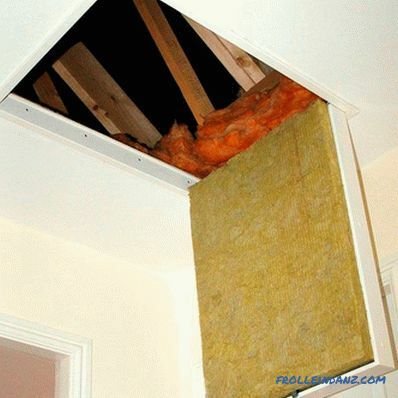 If the attic is warm, the insulation plays a smaller role than sound insulation. At the final stage you need to finish the cover. Of course, this article does not describe all the nuances of making a hatch in the attic . 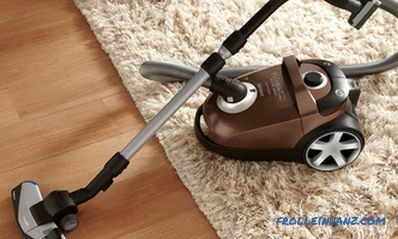 But, if you decide to do this work yourself, then surely you have the skills to perform such tasks. Otherwise, it is better to purchase a finished cover with a ladder, to which is attached detailed installation instructions. Also to help you attached video on the topic. All your questions, you can always ask the expert of our site.